MET and Pacific Esports team up to bring Battle Arena — a Dota tourney open to everyone! With a cool $1000 USD prize pool! Do you think you have what it takes to duke it out with the best Dota players in the country? 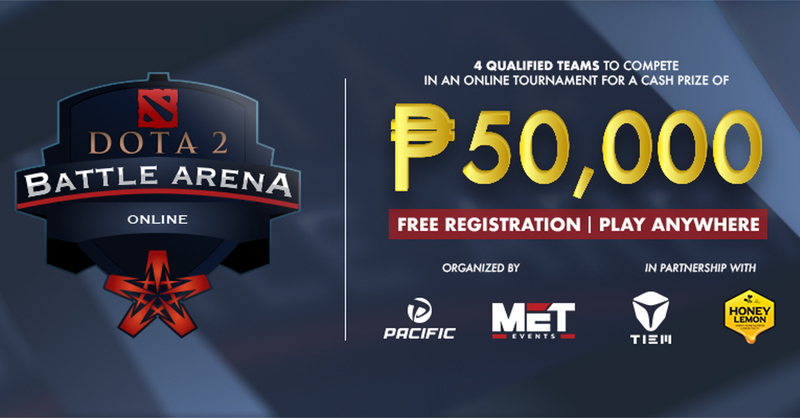 While you probably won’t be beating teams such as TNC and Execration anytime soon, here’s a tourney which will give you and your team the chance to prove your skill! MET, one of the biggest esports organizers in SEA, has recently partnered with Pacific Esports to bring Battle Arena — an online Dota 2 tournament that’s open to everyone in the Philippines. This online tourney will let the budding stars of the local Dota 2 scenes show what they’re made of, as they will battle it out for a chance to win the lion’s share of the tourney’s $1000 USD prize pool. Battle Arena will kick off with the Qualifier stage from November 24 to December 16, 2018. After the qualifiers, the top four teams will battle it out in the single-elimination Bo3 online Finals stage. The champion of Battle Arena will earn a cool $600 USD. Interested in joining Battle Arena? Absolutely anyone can join the tournament! For more information on the tourney, head on over to the MET website, or follow MET’s official Facebook page.